For other uses, see Penny Black (disambiguation). In 1837, British postal rates were high, complex and anomalous. To simplify matters, Sir Rowland Hill proposed an adhesive stamp to indicate pre-payment of postage. At the time it was normal for the recipient to pay postage on delivery, charged by the sheet and on distance travelled. 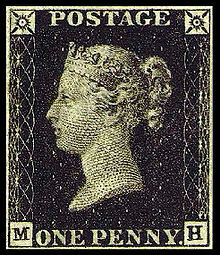 By contrast, the Penny Black allowed letters of up to 1⁄2 ounce (14 grams) to be delivered at a flat rate of one penny, regardless of distance. Initially, Hill specified that the stamps should be 3/4 inch square, but altered the dimensions to 3/4 inch wide by 7/8 inch tall (approx 19 x 22 mm) to accommodate the writing at the bottom. The word "POSTAGE" at the top of the design distinguishes it from a revenue stamp, which had long been used in the UK; "ONE PENNY." at the bottom shows the amount pre-paid for postage of the stamped letter. The background to the portrait consists of finely engraved engine turnings. The two upper corners hold Maltese crosses with radiant solar discs at their centres; the lower corner letters show the position of the stamp in the printed sheet, from "A A" at top left to "T L" at bottom right. The sheets, printed by Perkins Bacon, consisted of 240 stamps in 20 rows of 12 columns. One full sheet cost 240 pence or one pound; one row of 12 stamps cost a shilling. As the name suggests, the stamp was printed in black ink. A two penny stamp printed in blue and covering the double-letter rate (up to 1 oz or 28 g) was issued on 8 May 1840. Imprimatur sheets are from among the first sheets of stamps printed from a finished printing plate. The actual imprimatur (Let it be printed) refers to the written permission of the Inland Revenue officials entered on the back of the sheet of stamps. In the 19th century, it was common for officials to remove some stamps from each sheet to present as gifts to dignitaries and other important people. Individual stamps from an Imprimatur sheet can thus be found for sale on the open market. The stamps were printed in unperforated sheets, to be carefully cut with scissors for sale and use. As a result, stamps with badly cut margins, or no margins, are common and worth very little, while examples with four clear margins are rare and valuable, and fetch very high prices, especially if in mint condition. In addition to the general issue of the Penny Black, a similar stamp intended for official mail was produced, with the letters "V" and "R" replacing the crosses in the top corners. Because the general public quickly accepted the postage stamps and ridiculed the Mulready stationery produced at the same time, vast supplies of Mulready letter sheets were given for official use to government departments such as the tax office and the idea of introducing an official stamp was abandoned. Only a few postally used examples exist, which probably originate from the Post Office circulars sent out as advance notice of the new stamps. Four are known on covers; all were cut from their envelopes and then replaced. Most of the cancelled examples are from trials of cancellation types, inks, and experiments with their removal. Those trials led to the change from black to red stamps, and vice versa for the cancellations. Considered a British cultural icon, the Penny Black design features in the innovations section of the new British passport in 2015. Also in 2015, the search engine Google marked the 175th anniversary of the postage stamp with a Google doodle of the Penny Black. ^ Lawrence, Ken (1 January 1996). "Before the Penny Black (First Series)". Toke Nørby. Retrieved 30 April 2013. ^ Hill, H. W. (1940). The Fight for the Penny Post. London: Warne. pp. 75–79. ^ Taylor, R. A. "Wyon City Medal – 1837". Images of the World. Archived from the original on 19 April 2012. Retrieved 30 April 2013. ^ Letter from Rowland Hill, 16 December 1839, to Perkins, Baker and Petch. "The whole stamp is to occupy ¾ths of an inch square, including the lettering and engine-turned work. ", in Bacon, Vol. II p. 22. ^ Memo from Rowland Hill, 31 December 1839. "Or if practicable increase the length One eighth and insert in white letters at the bottom / ½ oz One Penny." in Bacon, Vol. II p. 22. ^ Feldman, David (17 February 1999). The First Cover: May 1, 1840 (PDF). Geneva: David Feldman. pp. 1–17. Retrieved 7 December 2017. ^ a b "Queen Victoria Stamps". The British Postal Museum & Archive. Retrieved 25 February 2015. ^ British Library collections – Philatelic Accessed 30 April 2013. ^ "Great Britain: Wednesday, May 6, 1840". First Issues Collectors Club. 3 November 2003. Retrieved 30 April 2013. ^ "Penny Black stamps price guide". ^ "Introducing the new UK passport design" (PDF). Gov.uk. 7 November 2016. ^ "What is a Penny Black stamp? Google Doodle celebrates landmark British design". The Independent. 7 November 2016. Golden, Catherine J. (2009). Posting It: The Victorian Revolution in Letter Writing. University Press of Florida. ISBN 978-0-8130-3379-2. Holyoake, Alan. The World's First Postage Stamp. London: Royal Philatelic Society, London, 2013 ISBN 978-0-900631-73-3, 159p. Jackson, Mike. May Dates: A survey of Penny Blacks, Twopenny Blues, Mulreadys and caricatures used during May 1840. Melton Mowbray, Leicestershire: Mike Jackson Publications, c1999. ISBN 0-952827-41-7. Litchfield, Percy C. Guide Lines To The Penny Black: a detailed description of each one of the 2880 stamps and the plates from which it was printed. London: R. Lowe, 1979. Nissen, Charles. Great Britain: The Penny Black: Its Plate Characteristics. Kent, [England]: F. Hugh Vallancey, 1948. Proud, Edward B. Penny Black Plates. Heathfield, East Sussex: International Postal Museum, 2015. This page is based on the Wikipedia article Penny Black; it is used under the Creative Commons Attribution-ShareAlike 3.0 Unported License (CC-BY-SA). You may redistribute it, verbatim or modified, providing that you comply with the terms of the CC-BY-SA.